First Home Dreams: Walls, Beautiful Walls! 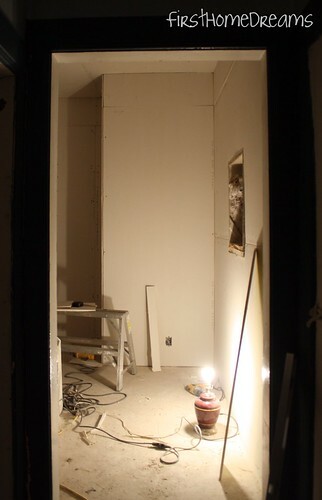 Well folks, we have drywall! 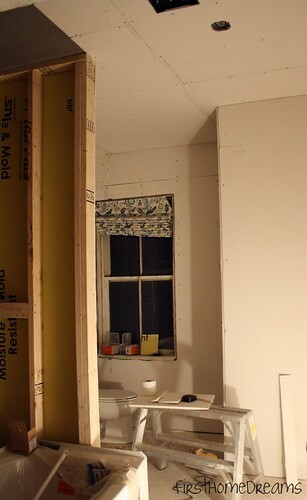 It's hasn't been mudded yet, but the bathroom is starting to feel like a room again. I'm sorry for the picture quality - the only light we have in the bathroom right now is a crummy old lamp, and it's been darkish by the time I get a chance to get in there with the camera. 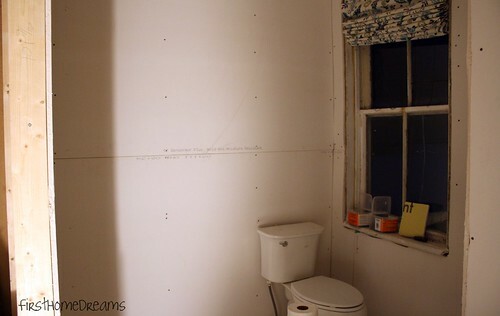 Looking into the bathroom, you can see the side of the laundry closet. When the room is finished, our new turtle tank and aquarium stand will be in the corner. 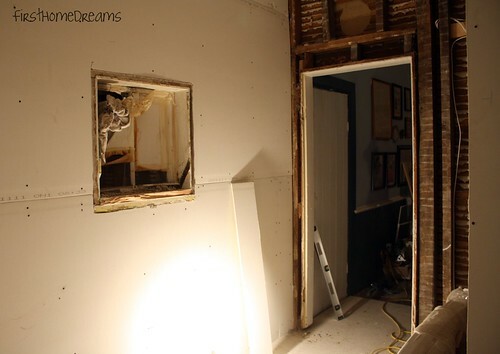 We're going to be gaining a ton of natural light through the window we're putting in on the right. 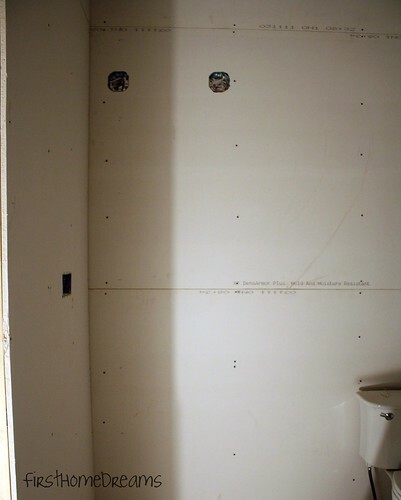 Immediately to the left of the door to the bathroom is the tub alcove, but nothing has been done in there yet (still waiting for the drain to be plumbed). I'm so excited to swap out these DIY roman shades for cafe curtains - so much more light is going to be able to stream in! Up until now that shade has always been drawn all the way to the bottom (and as soon as I'm home and the guys aren't working anymore, it comes back down). I'm also really looking forward to a new window that doesn't allow snow flakes to blow onto me while I'm...busy (true story). You can see the placement of the fan and ceiling light in the above picture, too. There's a ton of room to be able to get to the toilet, even though we really broke up the room with a tub alcove and a laundry closet. We waffled a bit on the placement of our mirror and wall sconces - I'm certain that they'll be fine where we wired them. The cut out to the left is to accommodate a GFCI (ground fault circuit interrupter) outlet, and two switches. One switch will be to the fan, and the other will be to the sconces (we're planning on putting in a motion sensor switch for the sconces to make sure they really do get turned off when no one's in the bathroom). Running electrical through exterior walls like ours is not easy, so we chose to avoid it. Placing the switches for the fan and sconces here is the only way we could adhere to our local code (a switch can't be within 1.5 meters of a bathtub or shower - or at least not be easily accessible from the tub or shower). There's no drywall on this end of the room because we decided that we might as well extend the subway tile that we're doing in the tub alcove all the way out to the door, and even above the door. I think it will give the end product a more seamless look. On a totally unrelated note, I started thinking about my blog's "brand" last night. More specifically, I was thinking about a name change. Not a big one, just a little one: "Farm House Dreams". I love the fact that we live in a farm house. I love that we live rurally. I love that we have the ability to produce a lot of our own veggies, make maple syrup, keep bees and chickens. In addition to all of the renovation, restoration, and decoration...I dream of having a little hobby farm one day, too. Should I change my blog's name to encompass my hobby farming aspirations, or is there room for those dreams under the umbrella of the current title?